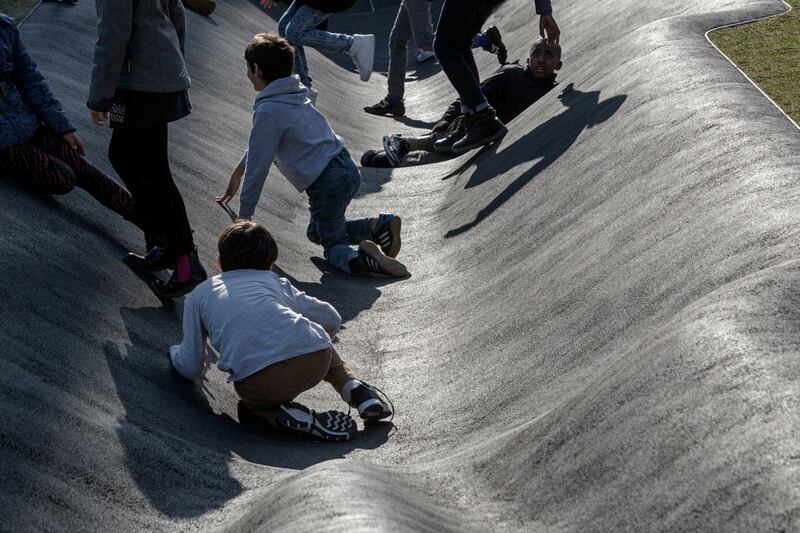 Gilles Brusset: The Fold’s childhood is a sculpture-landscape, monumental and elongated in the land of the place called Boudines. 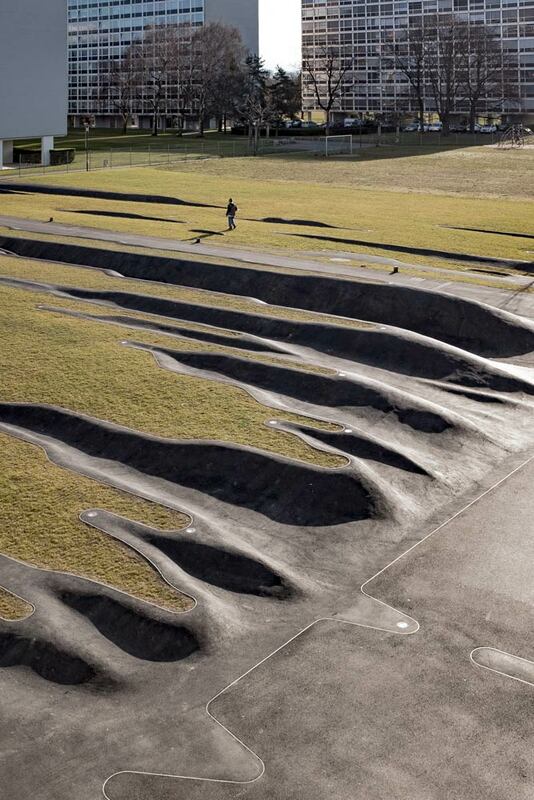 It takes part to a surface of soil of 2600m². 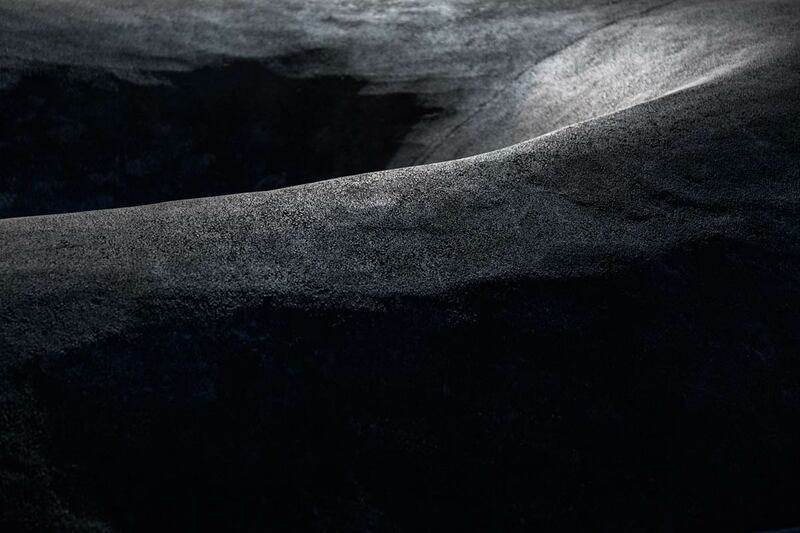 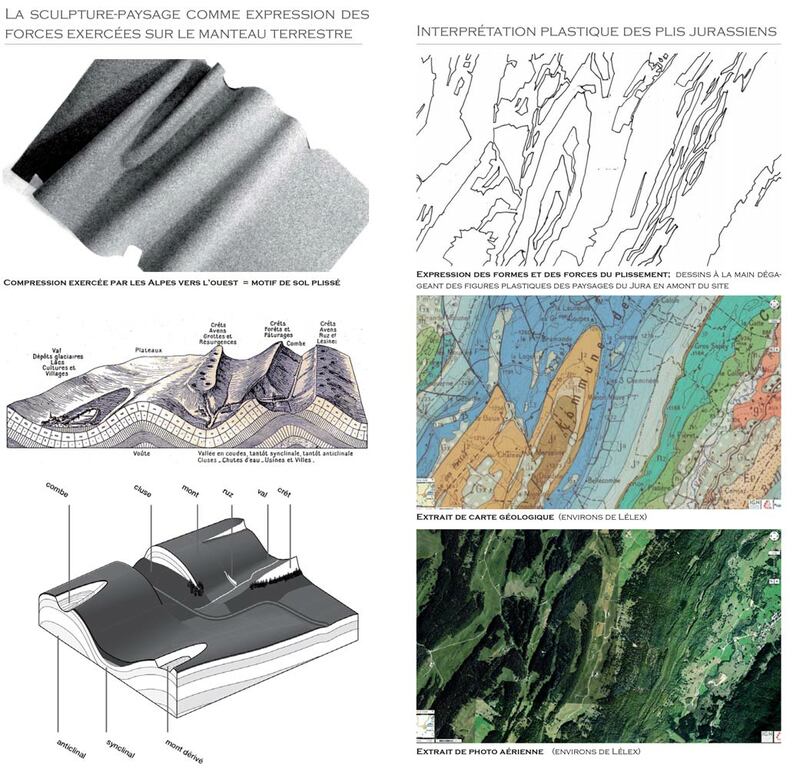 Its forms are an interpretation of the force that spawned landscapes of the Jura massif mountains (Jura folds). 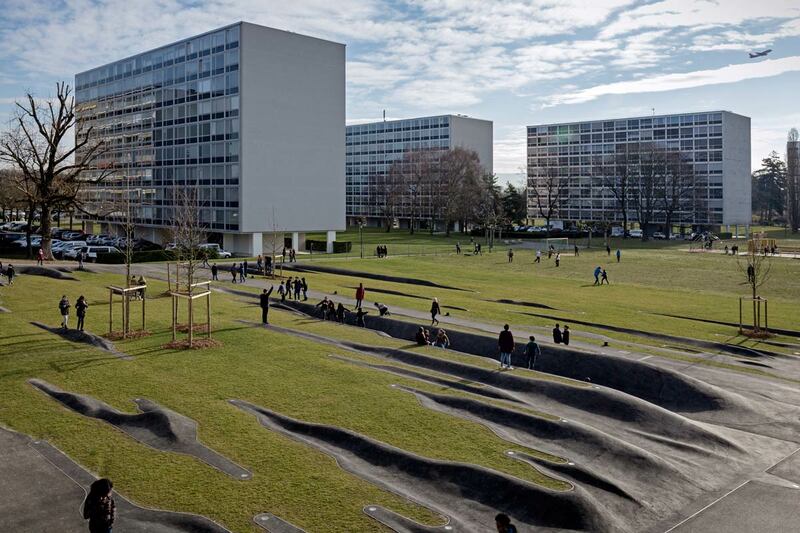 Meeting of 2 formal systems: In the orthogonal landscape of Meyrin-park and near the flat facades of the École des Boudines, sculpture-landscape emerges in curves and volumes. 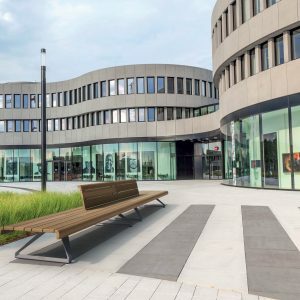 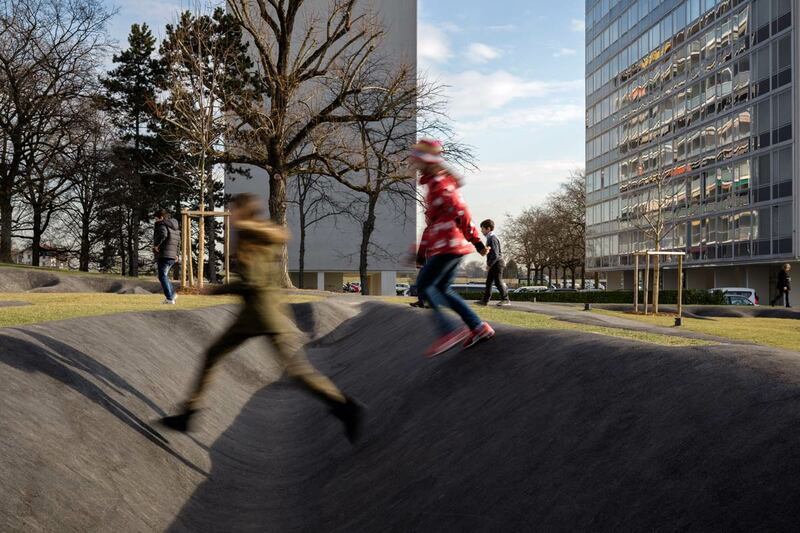 It is a response to the principle of tabula rasa, to the deliberate ignorance of the pre-existing landscape that presided over the realization of Meyrin-park. 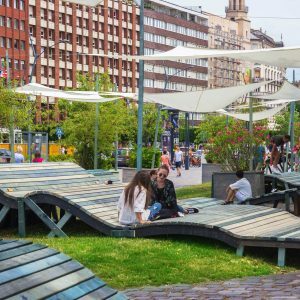 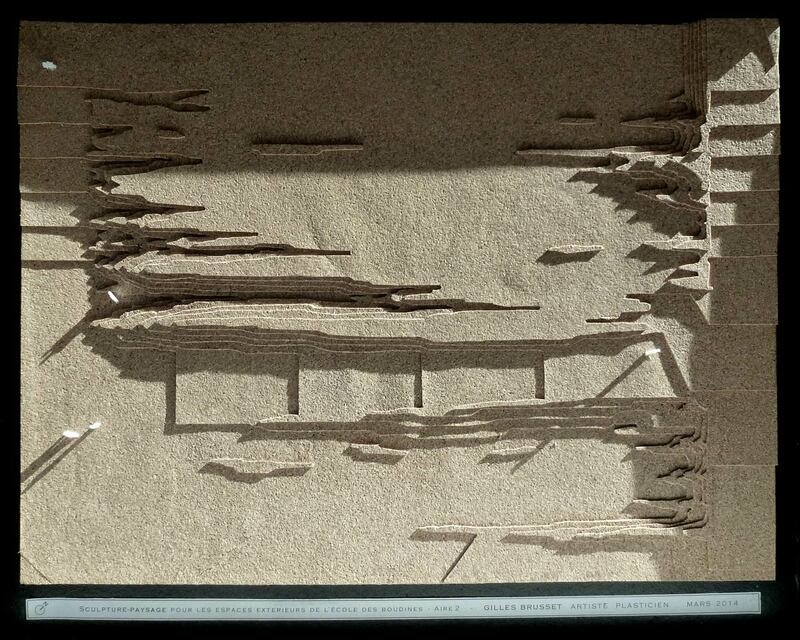 Within the modern “radical” city, the artistic project inscribes a set of differentiated forms, extraordinary in the context of the orthonormal city. 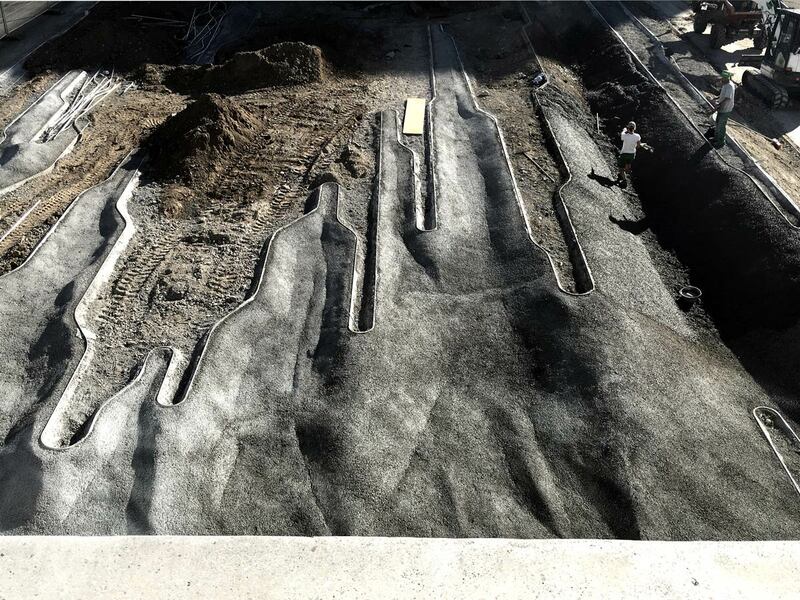 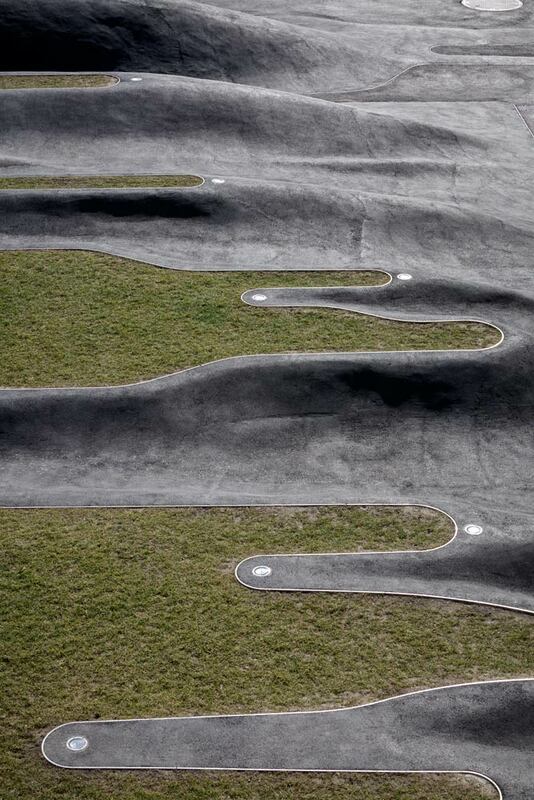 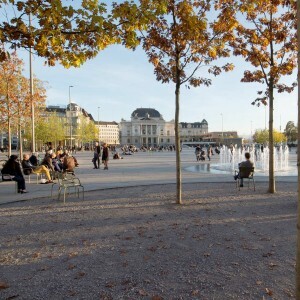 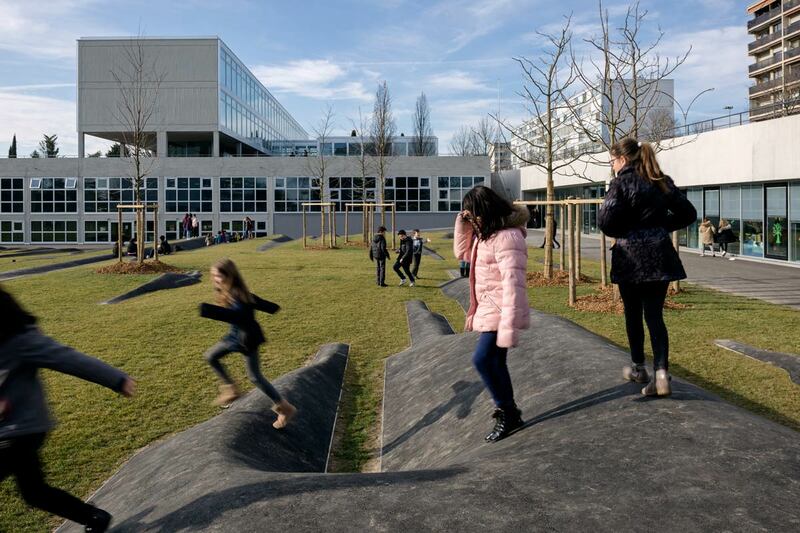 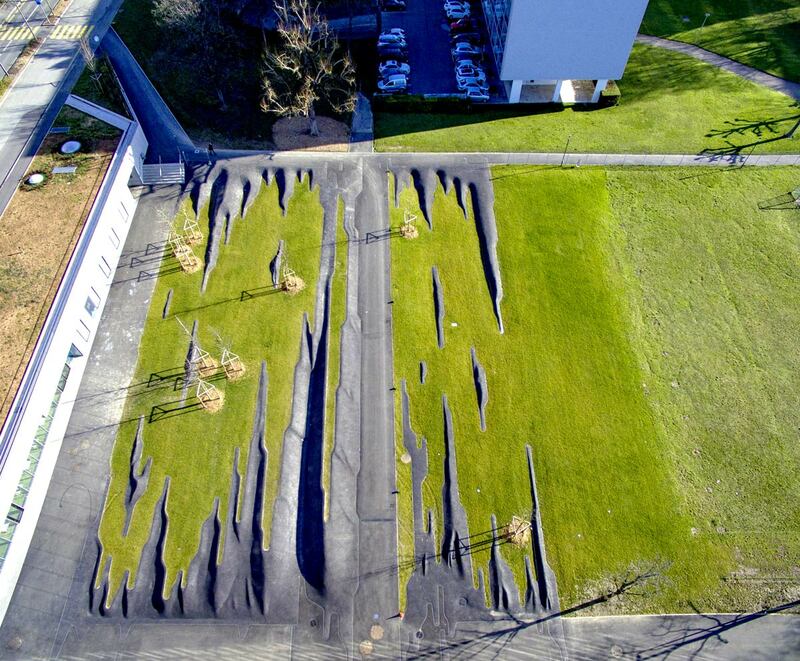 The return of the topographical plot: The formal system of sculpture freely develops its dynamic undulations in the ground of the exterior spaces of the École des Boudines, freed from the relentless formal system of the straight lines of Meyrin-park. 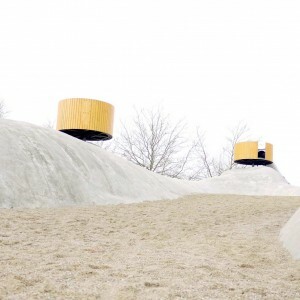 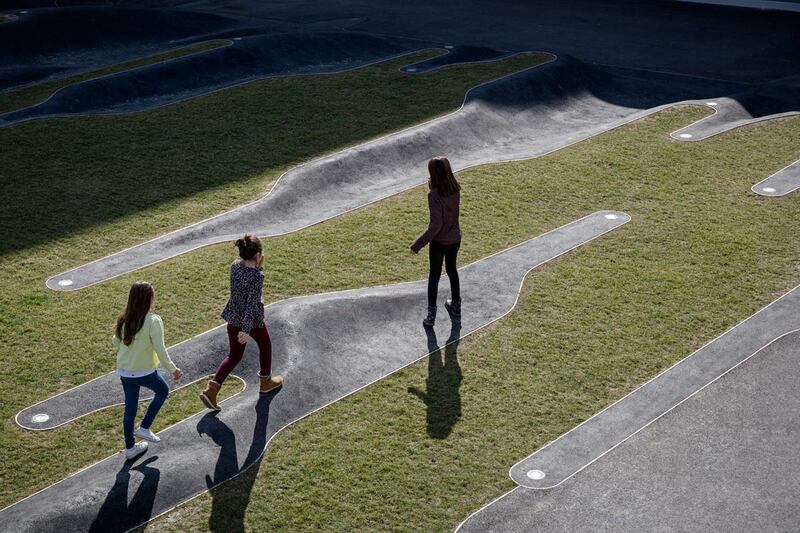 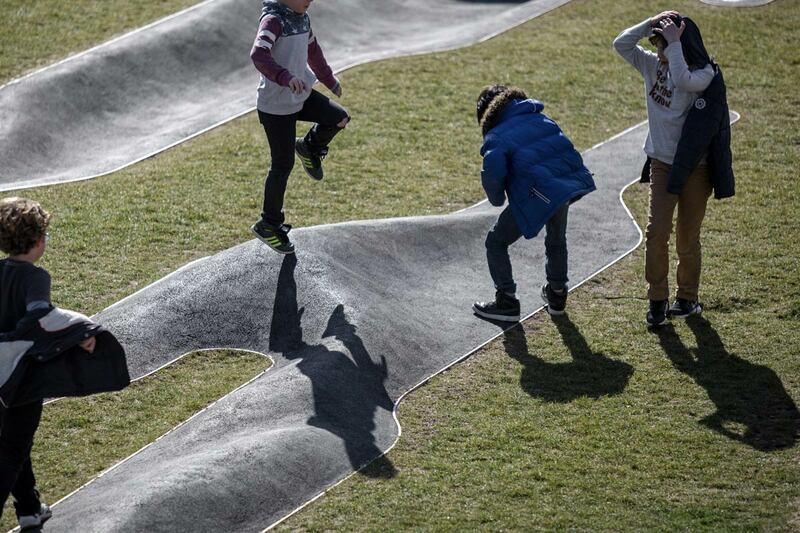 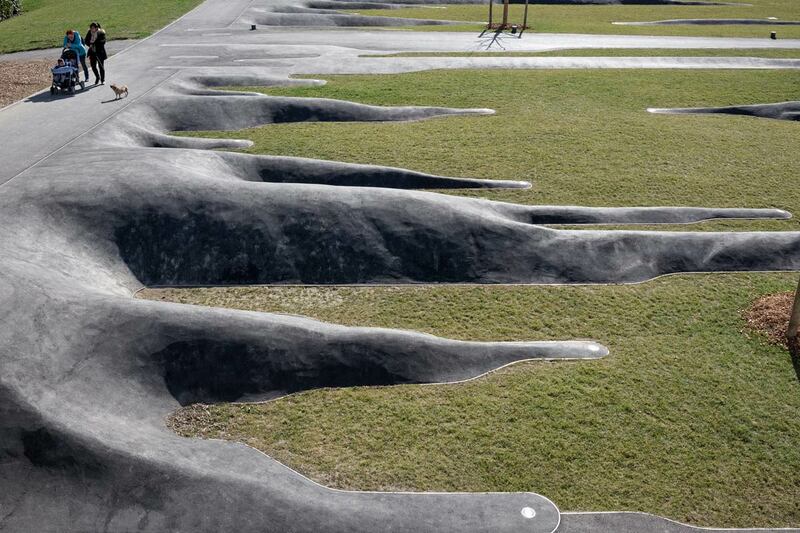 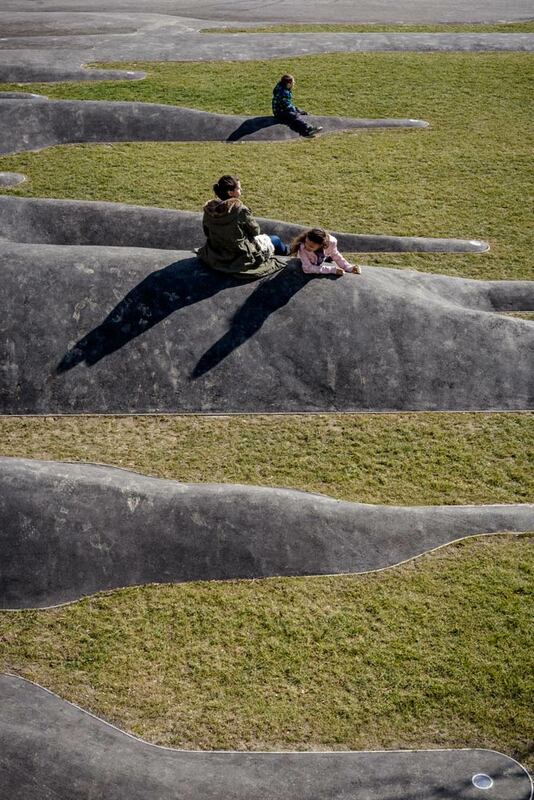 Art and landscape – The fold’s childhood is a work of art carved in the field of Meyrin-park. 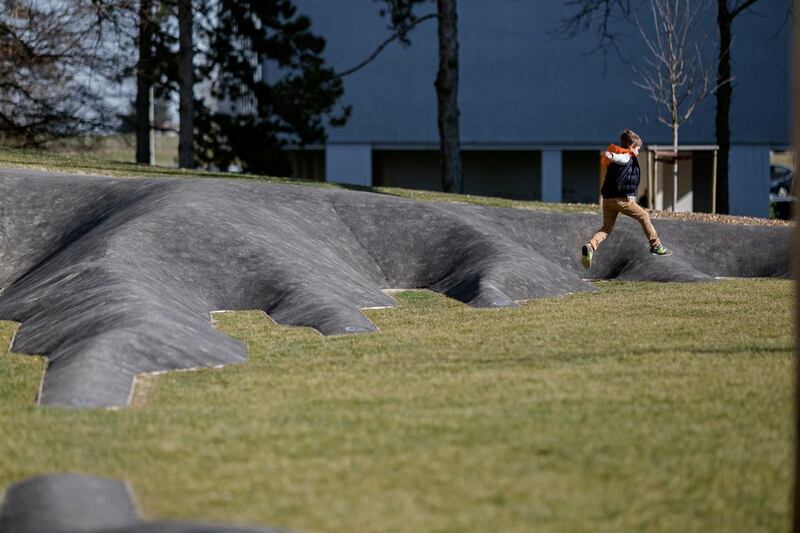 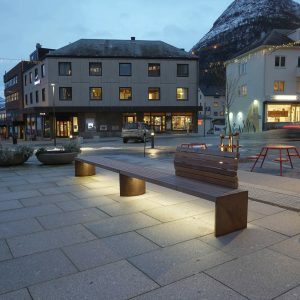 Located between the park and the buildings, between architecture and landscape, it questions the status of art in public space and landscape as a work of art. 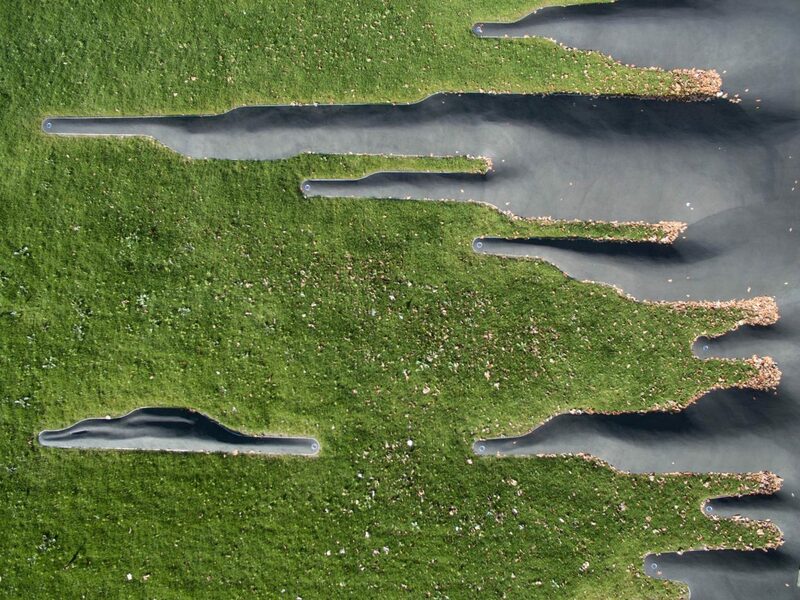 Designed with the tools of the landscaper, the work implicitly poses the question of the part of creation that can involve the profession of landscaper. 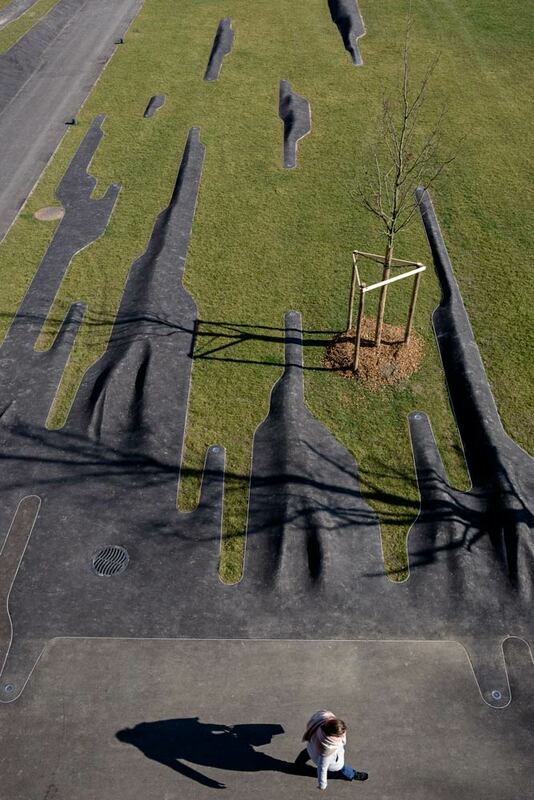 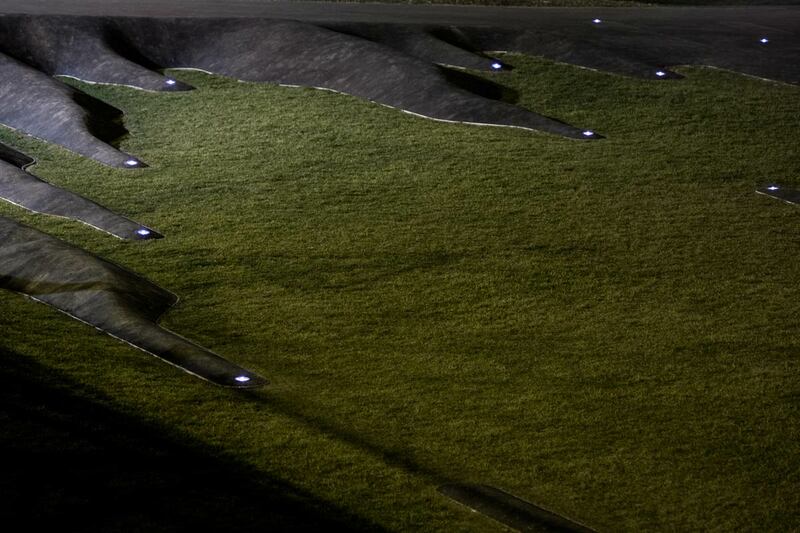 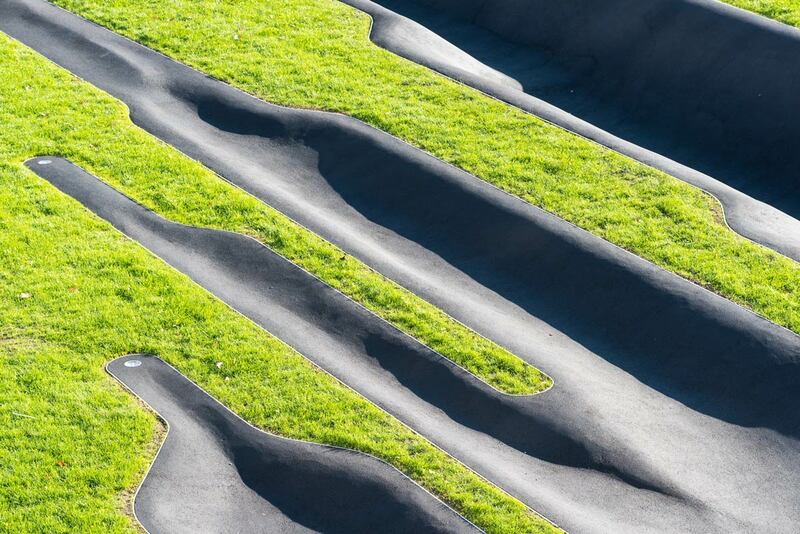 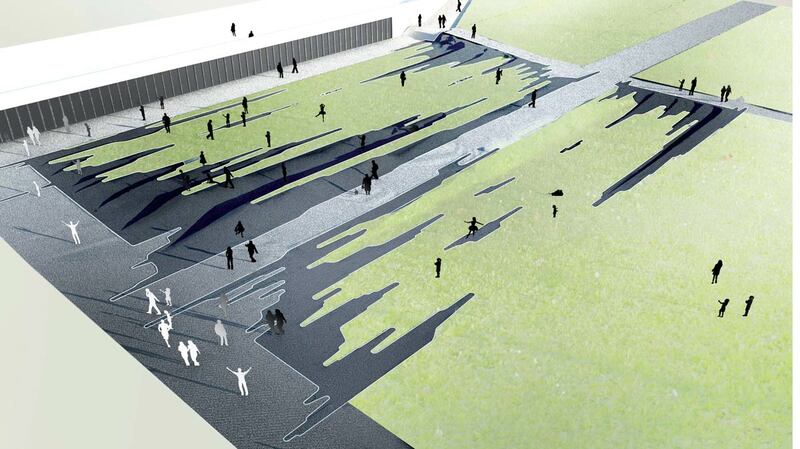 Is the landscape architect an artist? 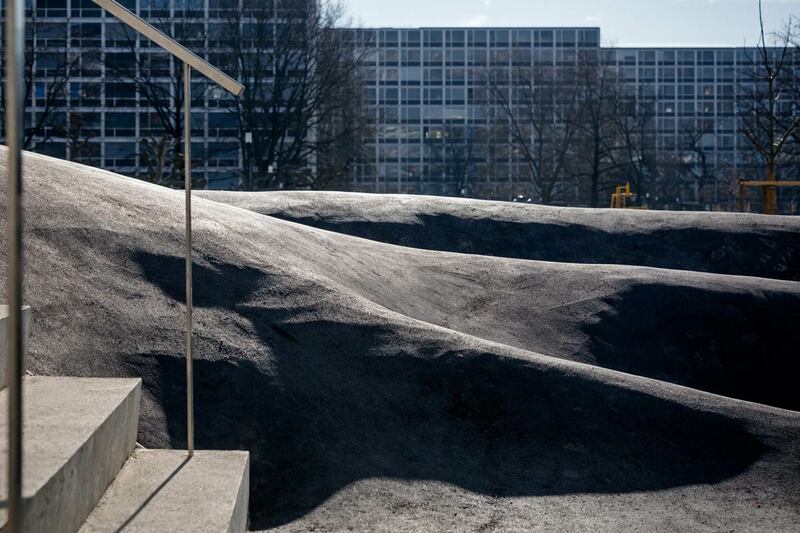 The nature of the commands does not automatically imply the design of a space under the sky – arrangement – as an act of creation. 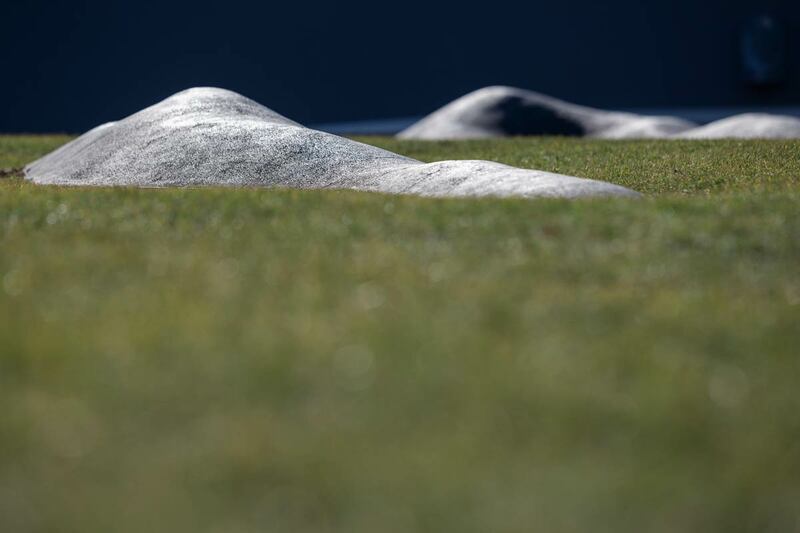 The double status of Gilles Brusset, directing a landscape agency as a parallel of his artistic activity, makes it possible to conceive the conception of landscapes as acts of creation and the conception of works of art as landscapes. 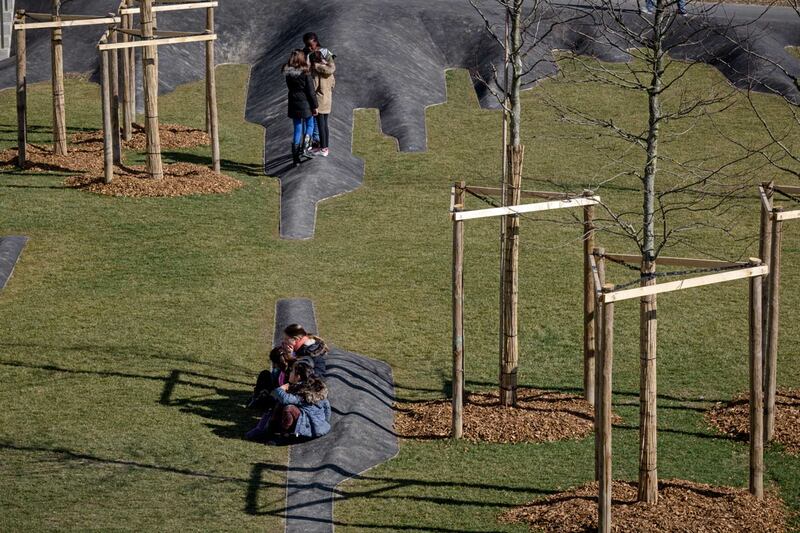 The site involved – The principle of the sculpture-landscape of the fold’s childhood is that of the inscription of one landscape in another. 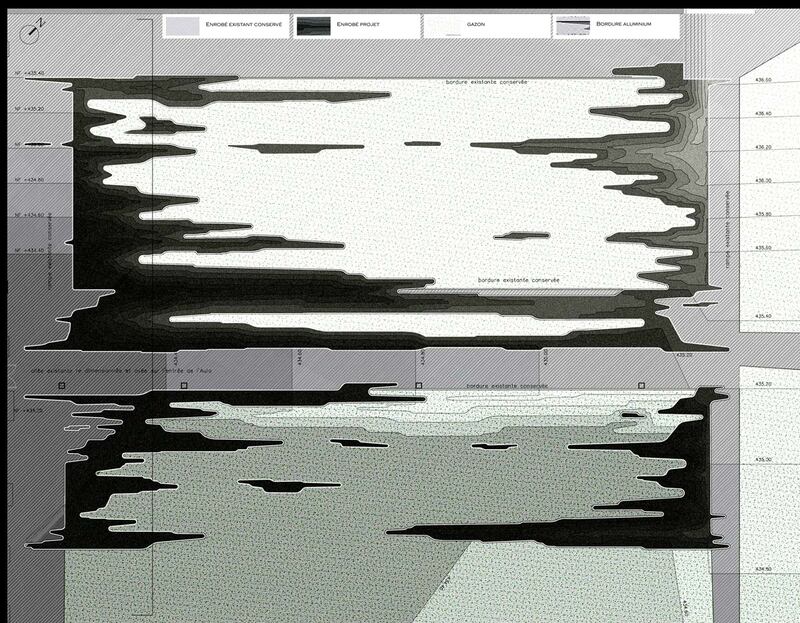 On the one hand, the site is involved in its physical physical dimension, and on the other hand in its geographical dimension at the territorial scale. 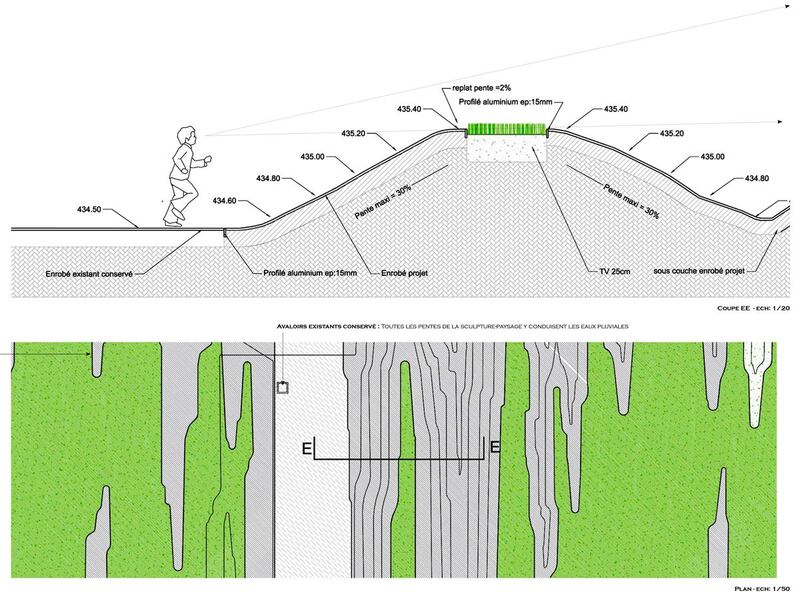 Existing site features (straight lines) are exacerbated by the contrasting effect of the inscription of the sculpture-landscape (curves). 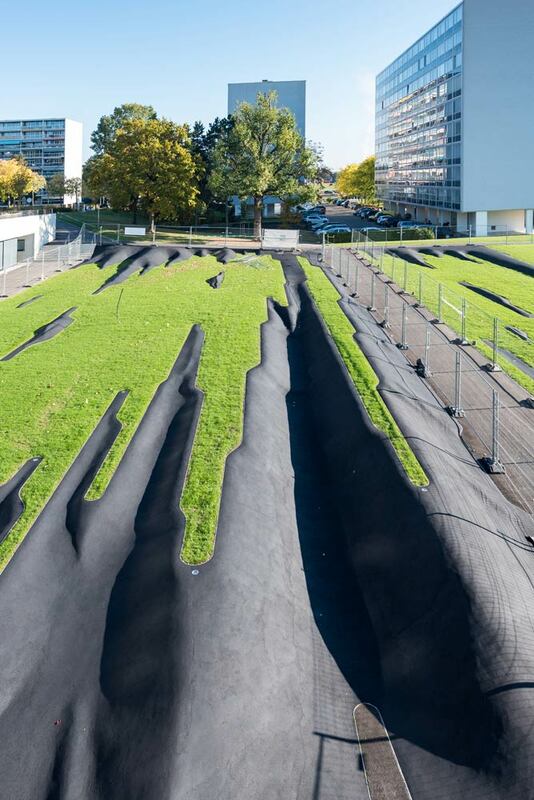 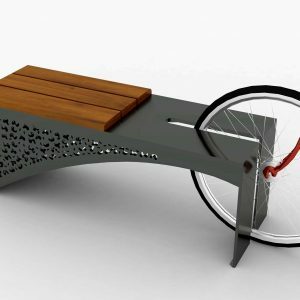 Art and civil engineering – The diversion of ordinary materials from roads and expressways to the benefit of a garden work of art has led to the appearance of extraordinary forms in the daily space.